Years back I started making my own DIY stamps for art projects. They take just a few seconds to make, and they are easy for little hands to hold. A while back I shared how we used our DIY stamps for Valentine’s Day art. 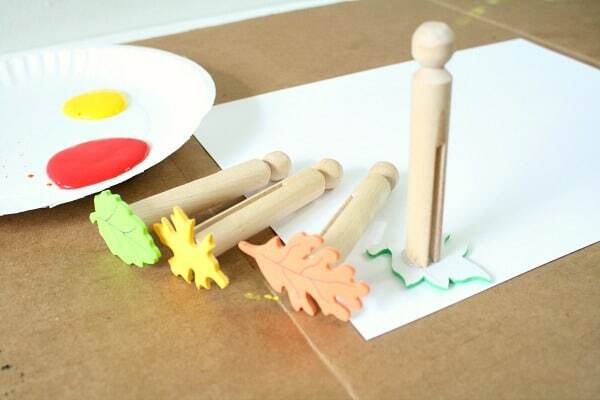 Here we are making DIY fall art stamps for kids. Use them for process art, to make picture frames around other fall art projects, or even to make patterns for some fall inspired math. 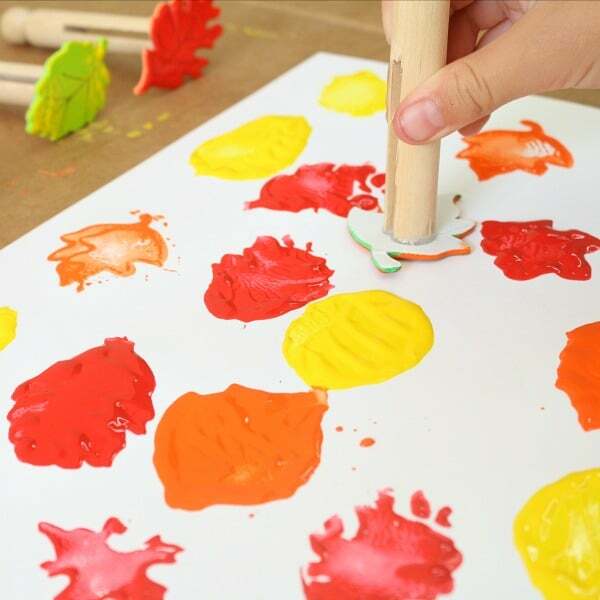 GET A FULL WEEK OF FALL THEME ACTIVITIES IN OUR PRINTABLE FALL PRESCHOOL LESSON PLANS. 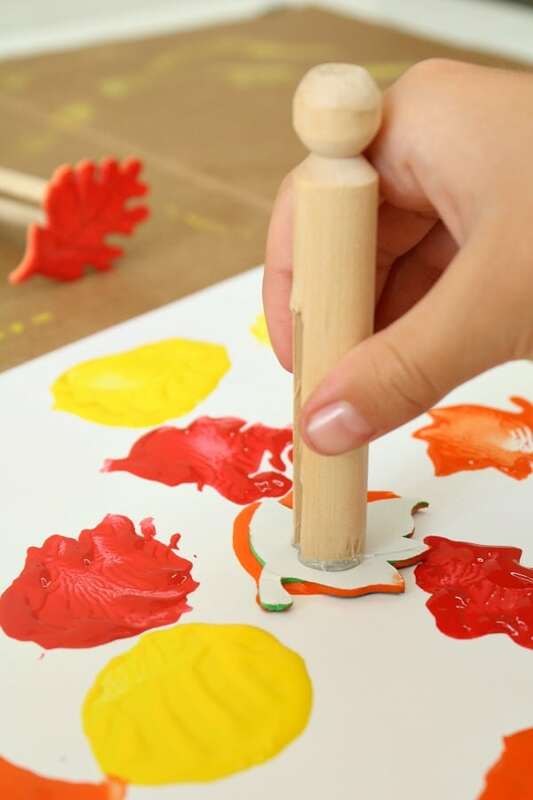 Watch this quick video to see how we make our DIY fall stamps and use them to create fall art. Then read on for the full tutorial. As I said these stamps take just a few seconds to make. You’ll need some fall foam stickers. We found that the ones with clear definition that wasn’t too small made the best imprints (you’ll notice the difference in the process photos below). 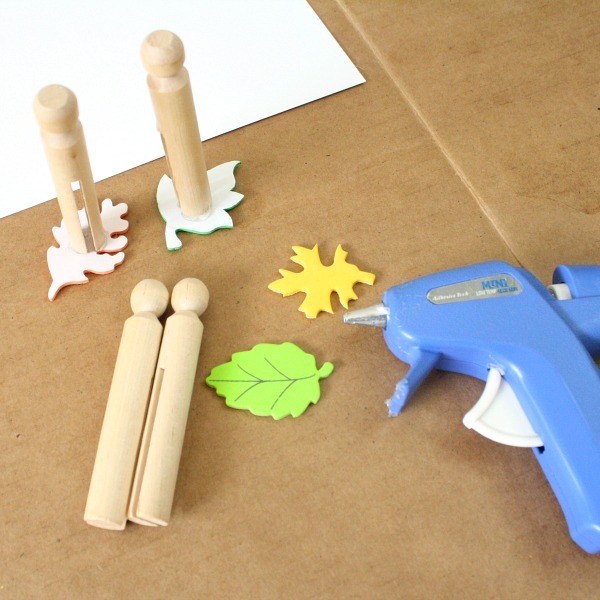 Hot glue your stickers to the end of a clothespin and you’re done! I strongly recommend giving kids the opportunity to freely experiment with the stamps and paint. Doing so allows them to test out which techniques work best. For example if there is too much paint and they squish it on the paper they’ll end of with a blob, so they’ll learn to get a bit less paint and gently stamp. Some of the stamps also work better if you slowly roll the stamp down starting on one side. They’ll create beautiful art as they experiment, but they may want a fresh piece of paper once they’ve got their technique down a bit. Practice sorting by placing matching stickers on pieces of cardstock. 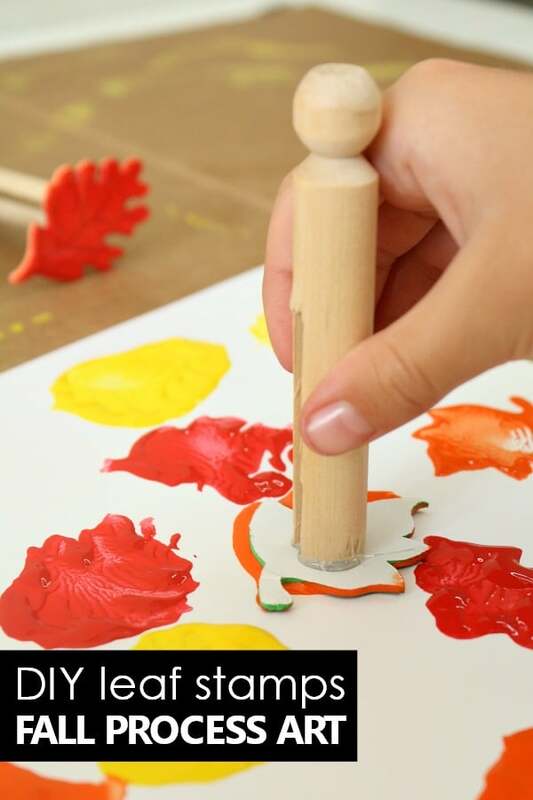 Kids can stamp paint with the matching stamp on the corresponding piece of paper. 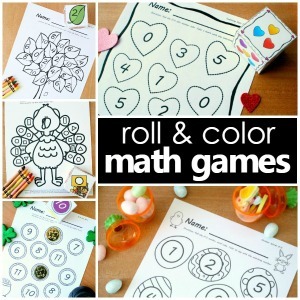 For more fall fun visit our fall theme resource pages. 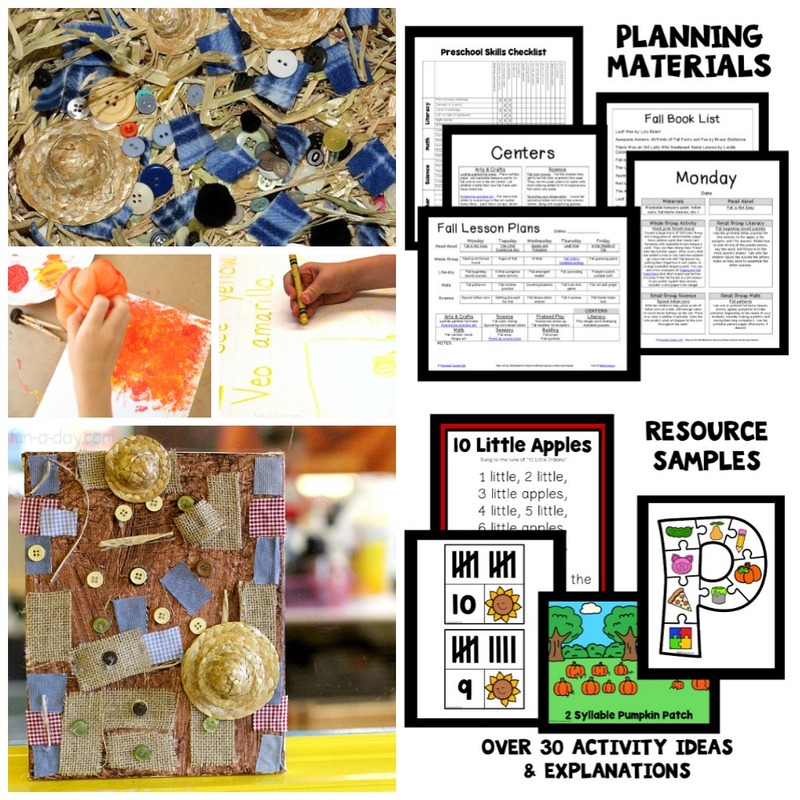 They are full of activity ideas, printables, videos, and more for teaching your fall themes. 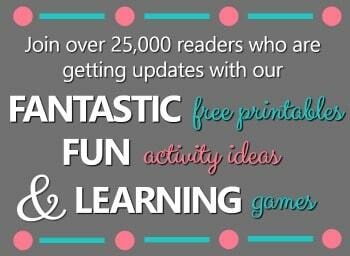 Pumpkin resource page coming soon too!